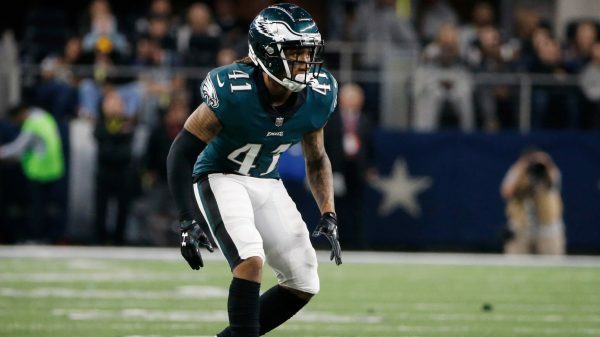 The Eagles suffered another blow to their defense in their loss on Sunday, as cornerback Ronald Darby suffered a torn ACL according to Tim McManus of ESPN. The injury did not look good on the field Sunday night, and coach Doug Pederson confirmed the worst on Monday morning. Already struggling at corner, the Eagles will now be without their best option for the rest of the season. That does not bode well for the team’s fortunes as they travel to New Orleans to take on the high-flying Saints in Week 11. And the injury could not have come at a worst time for Darby. Originally a second-round pick out of Florida State by the Buffalo Bills in 2015, the 24-year-old is on the last year of his rookie contract and is set to become a free agent in March. Be the first to comment on "Philadelphia Eagles CB Ronald Darby Out for the Season with Torn ACL"